The Dart SHP Pro block adds a new dimension to the SHP line, with the affordability of an SHP block, new features for more powerful engine builds and the desirable weight of an SHP casting. The SHP Pro has all of the features that make the SHP block so popular; priority main oiling, siamesed bores, extra thick decks and compatibility with most OEM parts, in addition it sports some new features that make it suitable for builds that will use higher spring pressures and run at higher rpm ranges. 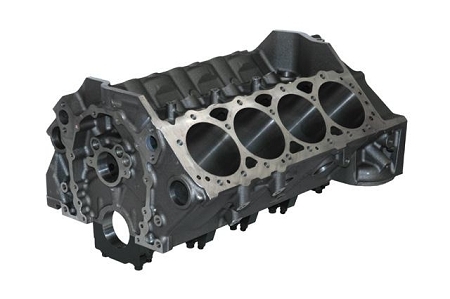 Billet main caps, a big block cam bore and bigger lifter bores add up to greater strength and stability. Brand new precision machined, light weight cast iron block. 350 or 400 main journals accept commonly available crankshafts.